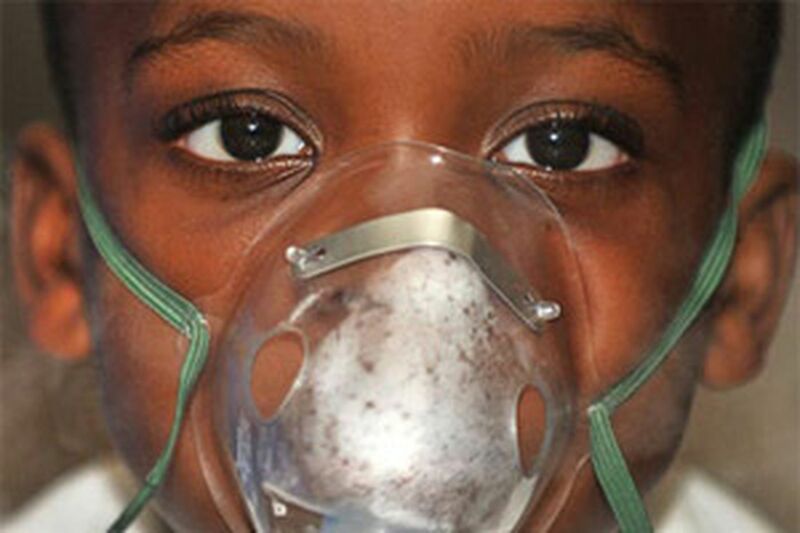 Myra Young fits a nebulizer mask over her son Todd's face to beat back his chronic asthma. Inhaling vaporized medicine that keeps him breathing, the 4-year-old with large eyes leafs through a children's Bible to pass the time. Young, 41, is an unemployed nursing assistant who lost her job in 2007 caring for Todd during his two-month hospitalization. She watches nervously as the whirring machine eats electricity. The power to Young's two-bedroom rental in Kensington will be cut in two weeks because the bill has climbed to $770. She lives in the poorest place in Pennsylvania - the First Congressional District. According to a national poll, the district is the second-hungriest in America. Young, who is separated, is not without help. She receives monthly welfare payments of $205, along with $362 in food stamps, and $674 in Supplemental Security Income for Todd's illness - part of the safety net meant to aid the poor. Young's husband, a hotel kitchen worker, chips in as well. But all that help still keeps mother and son stuck at the poverty level - not nearly enough to pay the $625 rent, and feed Young's hungry child and his voracious breathing machine. Because Young hasn't worked since Todd's hospitalization, it's harder for her to get jobs; employers are wary of her two years away from nursing. "It's not easy," Young says, as her masked son looks at pictures of Noah filling his ark with animals, while the kilowatt hours accrue. Experts say that the American safety net is riddled with holes, and is not the panacea that the public believes it to be. "It's an unstable system," said Carey Morgan, executive director of the Greater Philadelphia Coalition Against Hunger. "People face many problems - it's like Hurricane Katrina every day in the First Congressional District. "And there's a huge misperception that anyone who asks for help gets what they need." Polls show that, although a vocal minority rails against government "handouts," most Americans support food stamps and child-nutrition programs, said Guy Molyneux, a partner at Hart Research Associates, a Washington firm that researches attitudes toward the poor. While the programs are considered vital in keeping poor Americans alive, many people erroneously believe that these efforts solve hunger, advocates say. Just 10 percent of Americans living in poverty receive welfare cash assistance, federal figures show. Welfare rolls in Pennsylvania dropped from nearly 500,000 in 1996, when Congress began to limit the program, to around 270,000 today - 95,000 of them in Philadelphia. Welfare'scash-assistance benefit is small - $403 monthly for a mother with two children, DPW figures show. The monthly average food stampbenefit in Pennsylvania is just $258 per household, said Blanchette. Often, that's not enough to feed a family for 30 days, according to research by the Boston Medical Center and the Drexel University School of Public Health. The 2008 study revealed that a Philadelphia family of four receiving maximum food-stamp benefits would still require an additional $3,165 annually to buy the amount of food that the federal government deems adequate. The result: Families often run out of food stamps 21 days into the month. As of June, 416,587 Philadelphians were getting food stamps, up from 329,903 in December 2007, when the recession began, Coalition figures show. Getting and keeping food stamps pose another set of hurdles, advocates say.People must navigate detailed application procedures, then face difficulties maintaining their eligibility. An investigation by the Coalition last year revealed that 62 percent of phone calls to a North Philadelphia service center went unanswered because there weren't enough statecaseworkers to manage food-stamp clients. Blanchette of DPW said conditions at the center have improved, but she acknowledged that DPW in Philadelphia alone lost 110 caseworkers in the last year, in part due to state budget cuts. Crystal Sears, 32, a single mother of three who has been unemployed since 2007 after being laid off from her caseworker's job at a religious social-service agency, describes Kafka-esque encounters with the food-stamp bureaucracy. It was ironic, since her job had been helping low-income clients get food assistance. Recounting a recent disastrous interaction, Sears said that caseworkers lost her paperwork, and she had to make three additional trips to the county office to straighten it out. During the intervening time, however, her family had no food stamps. "'There's no need to be upset,' they told me," Sears recalled. "'No need?' I said. 'This is how we survive.'" During the desperate fourth week of the month, many families turn to emergency food cupboards. But there they find a rickety, patchwork system run mostly by elderly do-gooders handing out limited supplies of food stored in church closets, often without refrigeration, noted Bill Clark, executive director of Philabundance, the largest hunger-relief agency in the area. It provides some of the food to 476 Delaware Valley cupboards. Cupboards are scarce in the poorest areas, he said. Many are open just once a week. And each person gets only a three-day supply. Quite a few cupboards have rules precluding clients from coming more than once a month, Clark added. "Most places keep you from starving to death, but that's all," said Joanna Cruz, 26, who lives with her husband and three children in the district in South Philadelphia. Cruz is a former day-care worker taking Salvation Army classes to learn to be a kitchen worker. Her husband, Silito, makes $8 an hour washing dishes in a Walnut Street bar. His salary, combined with the family's allotment of welfare and food stamps, brings in the equivalent of $15,000 a year - $10,000 below the poverty level for a family of five. They turn to food pantries to make up the difference. The general public believes things run more smoothly than they actually do, Clark said, adding: "Say you're in a car wreck. You expect an ambulance will take you to a hospital that is always open, to a doctor who is always there. "In a food emergency, however, you may not know where the cupboards are, they're not open 24-7, and you may wait in line till they run out of food and tell you, 'Sorry folks, that's all we've got.'" Beyond that, the state recently cut $250,000 out of the $18 million it spent last year to buy food for cupboards. At the same time, cupboards in the region reported that need shot up 66 percent over the last two years, Clark said. Other feeding programs - the Supplemental Nutrition Program for Women, Infants and Children, as well as school-lunch programs - feed around 170,000 in Philadelphia annually, government statistics show. But they're limited, advocates say. Hunger doesn't exist in a vacuum. The poor must constantly balance meager resources to pay for shelter and utilities along with food, advocates say. A 2009 study showed that children on the waiting lists for Philadelphia Housing Authority or Section 8 subsidized housing were two times more likely to be underweight than children in the same economic bracket who are already living in subsidized housing. The study, which included children being seen by doctors at St. Christopher's Hospital for Children in the First Congressional District, was conducted by pediatric researchers around the country, including Drexel University's School of Public Health. Many poor people are eligible for subsidized housing, but supplies are short. There's a nine-year waiting list for public housing in the city, said Rachel Garland, a housing expert with Community Legal Services. For Section 8 subsidized housing, the list is 10 years long, she said. Her son's nebulizer treatment complete, Myra Young removes the mask from Todd's face. It's the third week of the month - no more food stamps. Young will be asking her mother for a chicken. Grateful for the help she's gotten but worried that she'll lose electricity for Todd's nebulizer, Young doesn't want to rely on the safety net a day longer. "I would love to punch a clock," she said. "But I can't find work and it's irritating. "I'm a mother taking care of her son. And I refuse to collect welfare for the rest of my life. I just will not do it."